Janet and I have been teaching Chair Based Exercise for 9 years and we are really passionate about it. Just because you aren’t too steady on your feet, let alone happy to run or jump, doesn’t mean that you can’t exercise and it doesn’t mean that you shouldn’t exercise. We all need to move more – and move differently – and move better! How might I benefit from Chair Based Exercise? 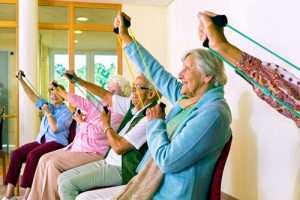 Do you have a group of Older Adults that might like to do Chair Based Exercise? Janet and I can both deliver sessions in Retirement Flats, Sheltered Housing, Care Homes and for Day Centres/Lunch Clubs. If you work in a setting like this or you and a group of friends are interested, please do get in touch. For too long, the benefits of Pilates have only been available to people who could access and use the studio equipment like the Reformer, or who could get down and work on a mat. However, we can begin to address this by teaching Pilates in the chair. 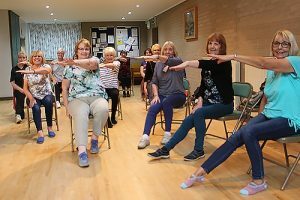 Alison can teach Chair Based Pilates, blended with a little mainstream chair based strength training and movement to music. (We aim to include Glen, a hint of rat pack, Dusty or Elvis. All requests considered!). Read my blog post about Chair Based Pilates called Chair Based Exercise – There’s More to it than Meets the Floor. If you are interested in Chair Based Pilates for a group that you work with, please do get in touch. Phone 0775 166 2158 for more details. There are two classes, held in conjunction with the Leeds Jewish Welfare Board. Every Monday from 10.30 – 11.30am. Gentle exercise class, mostly standing up. Every Wednesday from 10.30am – 12 midday. Largely a chair based exercise class. This class is hosted by Net Garforth. Mixed level class – partially chair based, partially standing. It’s a friendly group, always happy to welcome newcomers and the session includes a break and a cuppa! Janet is very nice to work with and I feel so much better when I have been to a class but sluggish if I miss one. I enjoy every part of the session. Our teacher is professional, caring and talented and the classes have opened up a whole new world for me. I am much fitter and more active than I have been in years.